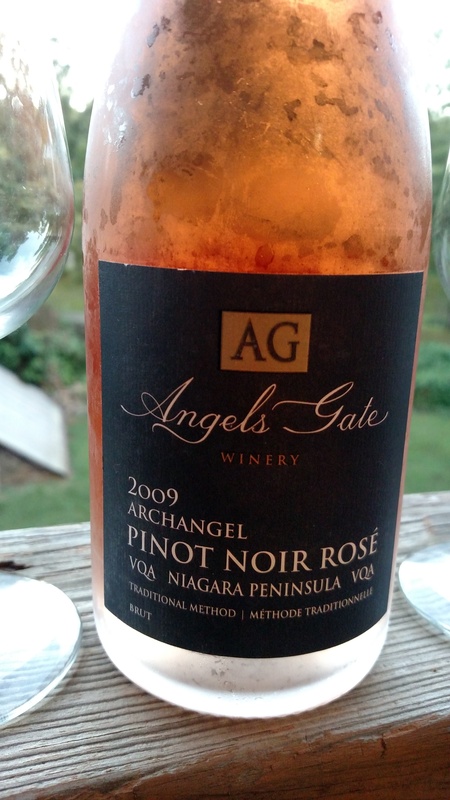 Angel’s Gate Archangel Pinot Noir Brut Rosé 2009 | Wine Splash! If the Angels have been stashing away their favorite wines, then they forgot to lock the gate because one of the best sparkling Rosés have just been discovered here! Angels Gate Winery is from the Niagara region of Canada and proves award winning wines can come from places you may least expect. And you thought Canada only had hockey, beer, Eskimo’s, and vast wilderness. Well add great food, flavorful wines, warm hospitality, and fun adventure to the list and you may have covered a bit more of what its all about. After a sip of this sparkling Rosé, you will know for sure! In the glass, this Pinot Noir Rosé is orange in color with a slight salmon hue. A nice parade of delicate bubbles race to the rim of the glass. Aromas of ripe cherries, wet stone, and yeast are enticing! Medium weight across the palate, crisp, with small elegant bubbles. Intoxicating flavors of fresh raspberries, red cherries, and bread dough excite the senses! On the second sip, notes of watermelon came through with a slight minerality that leads to a long, festive finish. A fun bubbly that would be perfect for a big celebration, sipping wines with friends, or a more intimate setting with your favorite person. Pair with appetizers, seafood and shellfish, ham, or mild to medium cheeses. Average of $24 a bottle. 93 Points! WineSplashing! !